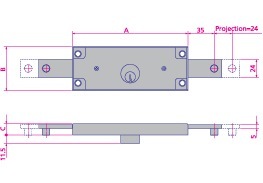 Thanks to the VIRO profile key, numerous KD bittings are available for the 8200 series roller shutter locks. The sturdy deadbolt provides high resistance to attack. Deadbolts: consisting of two 2.5mm thick laminated plates; total thickness 5mm.